Sometime in the 1980s, the mini-mall took over Los Angeles and this city has never been the same. There were always commercial buildings, but up until the 80s, they had something to say to the community other than crass crude ugliness. The mini-mall exists partially due to a weak city government, voracious greed, community apathy and an ignorance of design. One can love business and extol the need for trade, jobs and prosperity without endorsing blight and environmental degradation. 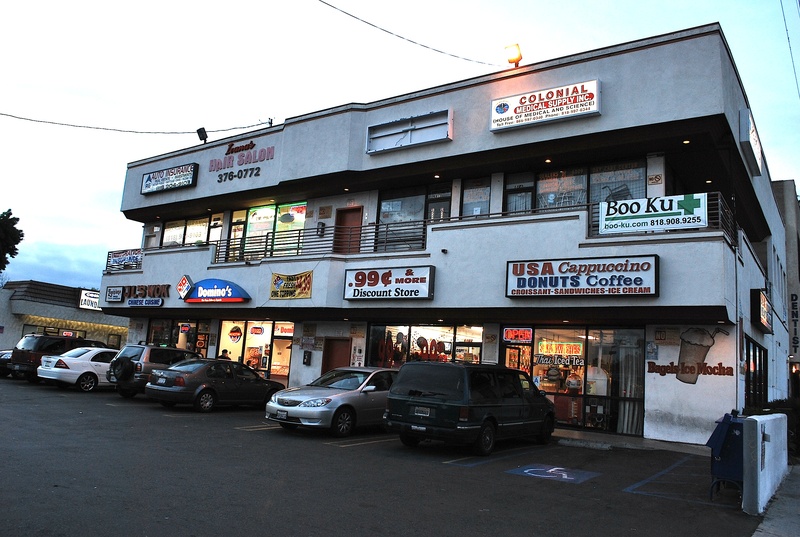 The photos above show 6811 Sepulveda Boulevard Van Nuys, CA 91405-4402. It is on the NW corner of Vanowen and Sepulveda and was constructed in 1986. At least this building doesn’t have a fake-rock exterior wainscoat. Or, another horror of the past, pink concrete block walls…. This house goes together with the building, like a hand and glove…. The absence of basic sophistication in years gone by, at least in terms of design and aesthetics, has always been both puzzling and dismaying to me. Actually as a lifelong Valley resident, I always associated the rise of the mini-mall with Herb Piken. Actually, the worst of the worst doesn’t date back to the age of the 1980s mini-mall, but to the 1940s and 1950s, when countless hundreds of commercial and retail strip buildings were thrown up all over the Los Angeles basin. Plain, cheap buildings, most sporting aluminum-framed windows, some with tacky, hokey fake-rock facades, often attached to or near power lines hanging all over the place. Ugly and depressing. And much of the housing from those same years was no better, if not worse. Decades of the Great Depression, World War II hardship and rationing, combined with the peculiarly bad taste of Midwestern and Dust-Bowl transplants to the West Coast ensured that much of LA back then would end up in a noticeably uninspiring and sad shape. We’ll probably never live that era down. Would you like to show a visual of a 1940s or 50s building that you think excels in hideousness the mini-mall on this page? Just pushing that building to the street and replacing the horrible can signs with something more dignified would make all the difference. Sometimes, if there’s residential directly behind the property, the residents prefer that they stare at the blank back wall rather rather than hearing cars and seeing “strangers” in “their” alley all the time. This can make things more challenging. On the subject of architecture, I wonder what your readers think about the Mellenthin-designed “bird-house” or “Cinderella Ranch” style houses like the one in your new header photo. When they were built, people either thought they were disgusting or adorably cute. The one in your picture might have replacement windows because usually the windows have diamond panes like the bedroom window on the right. I used to live in one on Parthenia east of Mason Av. Thank you for that architectural bit of history. There are still quite a lot of these around the Valley. I always thought that they were a strange hybrid of kitsch. Like putting a Swiss costume on a Spanish conquistador. hey andy…met you the other day when i ambushed you in my truck…great picture of the house on the corner of noble and lemay(? )…kind of like a flower pushing its way through a crack in a neglected, decrepit sidewalk. there are positive things happening in van nuys, you know. like my band, for example…www.myspace.com/donkeypunchpunks…proud to be from van nuys! and umm….well, i’m sure there’s more good stuff somewhere in VN….train your lens on those things every once in a while! be well….